Brother MFC-J6930DW 11 x 17 Ink Jet Printer, Business Smart Pro Wireless, All-in-One, Copy/Fax/Print/Scan - GS Direct, Inc. Delivers quality, reliability and value to your small business and workgroup environment. Print, copy, scan, and fax up to 11" x 17". Help save paper with automatic two-sided printing. 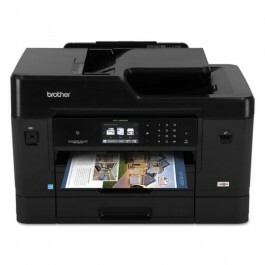 Genuine Brother super high-yield ink cartridges give you additional page yields and help lower printing costs. Print from your mobile device and access popular Cloud services via the touchscreen display. Features 3.7" color touchscreen display. Super high-yield genuine Brother ink cartridges offer additional page yields while helping to lower printing costs. Print and scan from almost anywhere--smartphone, tablet, laptop, and desktop computer. Scan to popular Cloud services directly.